Corn Chowder was never on the top of my “must have” food list. But, it was on the top of my late Dad’s. He loved Corn Chowder, but he did not have a particularly discriminating palate. The stuff he ate and loved while I was growing up was thick, bland and full of cream- a heart attack waiting to happen. He was particularly fond of it as a Saturday lunch and I can recall thinking, at age 10, just how uninteresting 1970’s corn chowder was; it was white, and had little to no flavor. Certainly, it was nothing I would ever want to eat. Well, we’ve come a long way, baby! My take on Corn Chowder is an adaptation of the Corn Chowder with Cheddar found in Ina Garten’s Barefoot Contessa. It is rich, without being overwhelming, and smoky-if you use the right bacon. Ina uses half and half, but I prefer whole or 2% milk. I find the soup is just too rich her way…and it’s pretty rich anyway- but it is perfect for a cool and rainy early fall day. It can be made with frozen corn, but if possible, I use the real thing. It is particularly good if made right now- ideally with local corn. And, I have come full circle as well because there is nothing that makes my daughter Julia happier than telling her that I have just made a batch of Corn Chowder. It tickles me to no end that Julia’s favorite soup is also my Dad’s favorite-although, the soup she eats bears very little resemblance to the stuff my Dad ate in the 1970’s. Still, each time she asks for a bowl at breakfast, (yes, breakfast!) 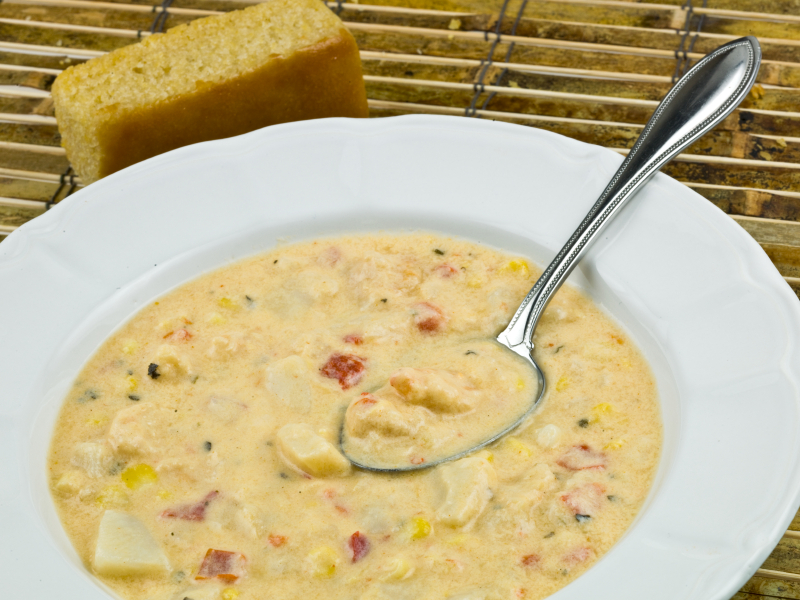 lunch or dinner, I can see my father smiling and hear him saying “Geez Babe, that’s good soup!” Somehow, despite the lack of a genetic bond, Dad’s love of Corn Chowder has been handed down to Julia. Not sure how it worked, but golly, I’ll take it! One Note: Splurge a little and use good Cheddar…it is worth it! ½ lbs sharp white Cheddar, grated, plus more for garnishing the soup. In a large stockpot on medium-high heat, cook the bacon pieces until crisp. Remove the bacon with a slotted spoon and set aside. Reduce the heat to medium, and add the onion and butter to the fat and cook for 10 minutes, until the onions are translucent. Stir in the flour, salt and pepper and cook for 3 minutes. Add the chicken stock and potatoes, bring to a boil, and simmer, uncovered for 15 minutes or until the potatoes are tender. Add the corn to the soup, then add the milk and Cheddar. Cook for 5 more minutes, until cheese is melted. Season with salt and pepper. Serve hot with a garnish of bacon. This entry was written by Caroline, posted on September 2, 2010 at 2:45 pm, filed under comfort food, soup. Bookmark the permalink. Follow any comments here with the RSS feed for this post. Post a comment or leave a trackback: Trackback URL.